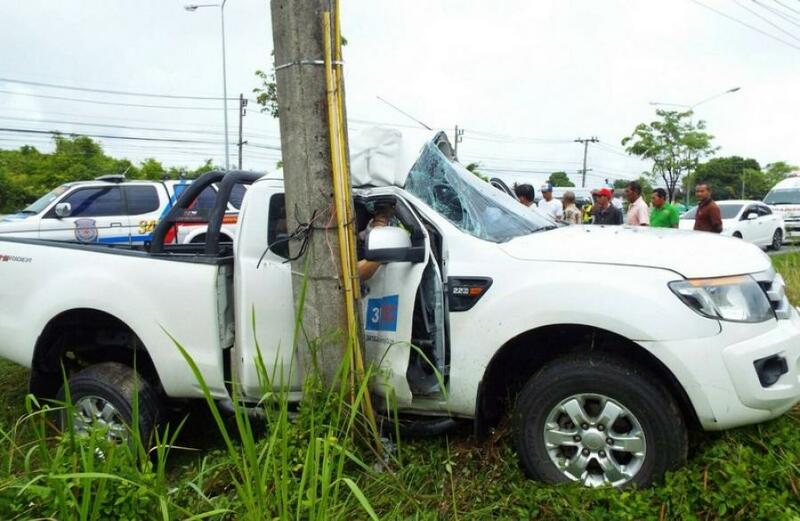 PHUKET: A 51-year-old man was injured after he crashed his pick-up truck into an electric pole on the side of the road in Mai Khao yesterday. Kusoldharm Foundation rescue workers arrived on the scene and administered first aid before transporting the victim to Thalang Hospital. “The driver’s side of the truck was tight against the pole, so rescue workers had to use Jaws of Life to extract Samra Montien, from Bangkok, from the vehicle,” said Lt Col Sarit Bootnongsang of the Tah Chat Chai Police. Witnesses told police that Mr Samran was speeding prior to the accident. “We suspect that he lost control because he was speeding and the roads were already slippery from the rain. Additionally, he may have been unfamiliar with the roads in Phuket,” the policeman added.